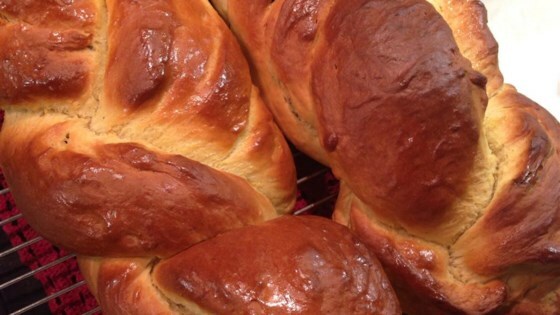 "The exotic scents of saffron and lemon will fill your kitchen when you bake this beautiful braided bread." Heat the milk in a small saucepan until it bubbles, then remove from heat; add butter, sugar and stir until melted. Let cool until lukewarm. In a small bowl, soak the saffron in the hot water, let cool until lukewarm, drain and reserve the liquid. In a large mixing bowl, combine the milk mixture with the reserved saffron water and eggs. Add the yeast and stir to dissolve. Add the salt, nutmeg, cinnamon, lemon zest and 4 cups of the flour; mix well. Add the remaining flour, 1/2 cup at a time, stirring well after each addition. When the dough has pulled together, turn it out onto a lightly floured surface and knead until smooth and elastic, about 8 minutes. Lightly oil a large mixing, place the dough in the bowl and turn to coat with oil. Cover with a damp cloth and let rise in a warm place until doubled in volume, about 1 hour. Deflate the dough and turn it out onto a lightly floured surface. Divide the dough into three equal pieces, form into 14 inch long 'ropes'. Braid the 'ropes' together and place on a lightly greased baking sheet. Cover with a damp cloth and let rise until doubled in volume, about 40 minutes. Bake at 350 degrees for 50 to 60 minutes or until golden brown and the bottom of the loaf sounds hollow when tapped. Remove to a wire rack and cool. See how to make old-fashioned Irish soda bread. incredible bread...wow very impressive, will DEFINITELY make again! Made a very large loaf. a very nice flavor and texture when fresh baked but it dried out very quickly. making very small loaves of this might be better.